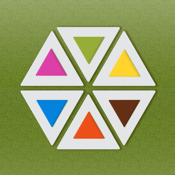 Mogamin, a dazzling puzzle game. Block your opponent(s) so they cannot make any more moves. Moves are taken in turn, alternating between the number of players on the field. The time for each turn is limited, so decide quickly, but strategically! Enjoy 18 game fields for free. - You win the game when your opponents are no longer able to move. - The fewer moves you make to block your opponents, the higher your score will be. - Decide fast and you will earn extra points. - Points are given for each opponent you block, bonus triangles and for the triangles that remain on the game field after you won the game. - To make a move, tick the triangle you want to move to. Beware: if you do not make your move within the given timeframe we will decide for you and this will not be the best position. - You can only move to triangles that have not been stepped on before and lie in an adjacent angle. - Blocking bars will make is more challenging to win. - Play against one to three virtual opponents. - Play over wifi with your friends. - Play directly on the iPad around the table with family or friends. - Create a profile to store your points outside Game Center and see your direct competition. It also stores your own created game fields when you buy the game fields creator. - Buy 32 additional game fields to expand your Mogamin experience. - Buy the game fields creator and play your own game fields. You will be able to host your own created game fields via wifi. Visit us at Mogamin.com and share your experience with us on Facebook.